** S/Sgt Misiak volunteered for a second combat tour. He was KIA on 21 July 1944 on a mission with the 305th Bomb Group. He is buried in Loraine American Cemetery, France. Crew Incident: 06 September 1943, Mission #67 to Stuttgart, Germany in B-17F #42-29944 Winning Run aka Buzzing Bronco (427th BS) GN-E. It became apparent when reaching the French coast, on the return journey, that many of the B-17s were low on gas. 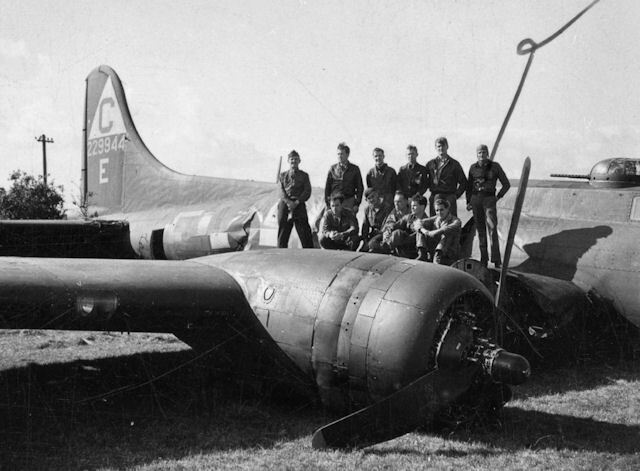 Ten of the nineteen 303rd BG(H) B-17s landed at bases other than Molesworth to refuel. Captain "Jake" James, Pilot of Winning Run made a wheel's up crash-landing on a small British Fighter practice landing airfield at Deanland (near Uckland), England with all four engines dead due to lack of fuel. He was forced to take instant evasive action to miss another Fortress making an emergency landing on an intersecting runway. The aircraft was a total loss and three crewmen sustained slight injuries as a result of the crash. A passenger on the flight was Life Magazine War Correspondent Frank T. Scherschel. His story of the crash landing "Any landing you walk away from is a good one" appeared in the 11 October 1943 issue of Life Magazine. 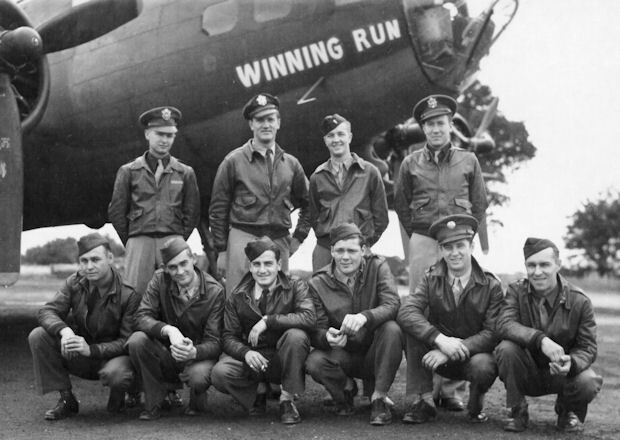 Winning Run was the regular B-17 of Capt Billy B. Southworth, Jr. whose father was the Manager of the St. Louis Cardinals baseball team. Captain Southworth, who completed his combat tour, was later killed in an aircraft accident in New York. T/Sgt Albert E. Martell, Jr. (WG) replacing S/Sgt Leonard A. Kesky. Sgt Kesky was Killed in Action on 17 August 1943 mission #60 to Schweinfurt, Germany while flying with the Lt Curtis Olsen Crew. He is buried in the Cambridge American Cemetery.